Truth by Kbaig: Morale of the Army………. Politicians? Morale of the Army………. Politicians? Country is facing a strange situation; whether it is deaths in Karachi or any other national tragedy, govt. seems to be indifferent to it. 2 months ago metropolitan and coastal city Karachi had to face acute shortage of water. Media continuously reported the shortage of water, criticized Sindh Provincial govt. and public protest. Media reported that water tanker costing 2000 rupees was being sold for 22000 rupees. Despite of the reported Bitter realities such like that the misappropriation and corruption of the funds in the name water supply continued unchecked. 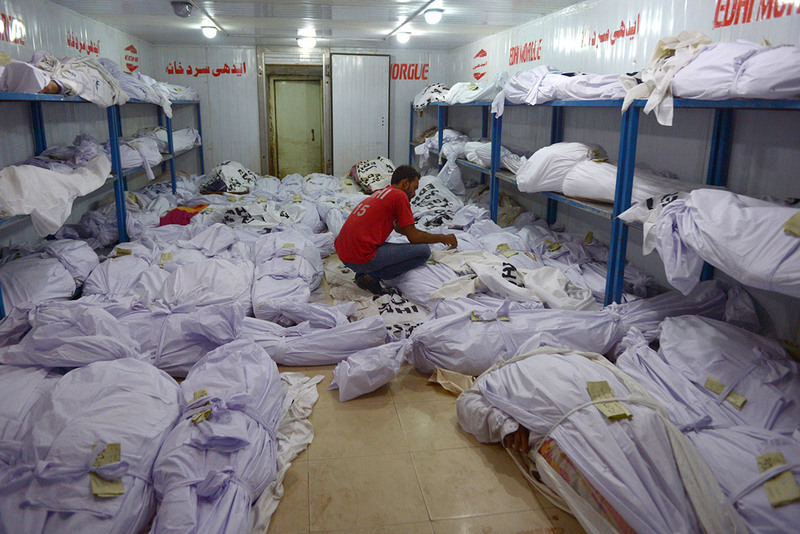 With the start of June inhabitants of Karachi became target of scorching heat and many died due to heat stroke. For the govt. the deceased proved to be equivalent to insects; within 4 days more than 1200 people became target of heat wave. 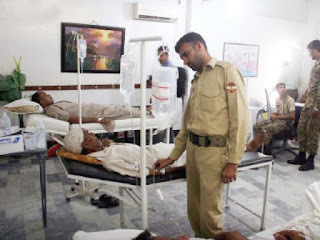 Media reported that people in Karachi does not have water and electricity, when the patients of heat stroke are taken to the hospitals there is shortage of life saving drugs and first aid. This is Karachi not some remote area of inner Sindh or Thar but one of the developed cities of Asia. In such a developed city if people die in such a big number, then one is forced to think that where are our so called elected democratic rulers and people look towards armed forces for relief. In such a tragic situation Pak-army established relief camps to cure people hit by the heat stroke and provide medical relief. Here the question is where are those who claim to have the mandate of the public, who are known as elected public representatives imposed upon us by the foreign powers in the name of democracy why do not these people come forward to provide relief to the public. Whenever any big tragedy happens, hundreds of people lose their lives but political representatives are seen engaged in blame game; Provincial govt. blaming Federal govt. and vice versa. No one is ready to accept the responsibility or even to come ahead to provide relief. Whatever happened to people of Karachi in this summer and loadsheding and the remarks of Chief Minister of Sindh Qaim Ali Shah over this tragedy have become laughing stock for Pakistan all over the world as he said that if people show some more patience we can kill terrorists through thirst as well. In the last years whatever happened to the people of Thar in the form of shortage of food, drinking water and draught is really painful. Just in 2014 more than 1000 innocents lost their lives mostly infants and women while elected representatives remained indifferent to this situation in the name of safeguarding the democracy. When the tragic reports were leaked out through it was revealed that such like deaths are routine matter that happen everywhere. Keeping in view the criminal negligence and inactivity of political govt. army deployed in Hyderabad Cantonment took interest into the matter and established relief centers. On the public protest Prime Minister Nawaz Sharif was forced to visit the Thar area in the air-conditioned vehicles. When media lost attention over Thar due to coverage of other news, Federal and Provincial govt. thanked god for being relieved but Thar is still facing draught, hunger and thirst despite of all the govt. claims whether federal or provincial. 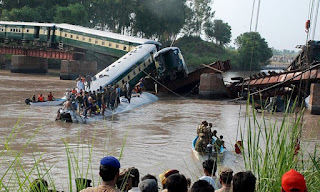 Few days ago a special train carrying military unit from Panu Aqil met with accident at Head Chanawan in which due to fall of a railway bridge engine along with four bogeys fell into the canal taking lives of 18 persons including Unit Commander Lt. 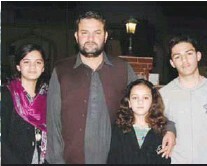 Colonel Amir Jadoon, his wife along with two children, Major Rashid, Captain Adil and Lt. Kashif and Railway engine driver. Transfers of military units are a routine of military for which special military trains are used. As per the tradition of Pak-army Unit Commander along with his family and officers move with their soldiers on these trains; Commanding Officer of the unit, officers and soldiers are just like a family who live and die together whether in peace or war. That is why when 4 bogeys fell into the 13 feet deep canal rest of the soldiers did waste even a single minute and got busy in rescue activities. Afterwards commando divers and other military relief teams reached at the spot from Gujranwala Cantonment. Here we would not get involved in the discussion that whether it was negligence of railways or a terrorist sabotage or why Minister for Railways raised suspicions of terrorist sabotage and afterwards when it was proved that accident occurred due to the lose bolts of railway track over the bridge why Railway minister just blamed the martyred train driver that accident happened due to his rash driving and not stopping and signing over the DEAD STOP 26 miles ahead of the bridge due to narrow turn. The question is when on the other day the funeral prayers of the martyrs were being offered where were the elected public representatives, why did not representatives of govt. like Chief Minister, Governor and others did not participate in the funeral, where were they busy? Whether soldier sacrifices his life in the battle field or on duty, these sacrifices demand solidarity and moral support from the nation. Army needs moral support to keep up its morale. Nation is represented by the govt. of the time. Even the Minister for Railways and other Ministers who are using helicopters to monitor the Ramadan Bazars did not participate in the funeral. If Army Chief can reach for the fueral then why not President or Prime Ministers? God knows why our rulers take public sufferings and problems as their (public) fate and providing relief and fighting against terrorism and enemies to save the motherland only the duty of army, perhaps they think they have been elected to fill up their coffers for their upcoming generations. Due to such criminal negligent behavior public is forced to look towards the army for relief and solution of their problems.